her grandson, poet Clemens Brentano, her granddaughter Bettina von Arnim and the famous opera singer Henriette Sontag, who was also born in Koblenz. The exhibition in the house of Beethoven’s mother was opened with a new overall concept on May 12th 2001 in the course of the festival »Ehrenbreitsteiner Kulturtage«; The exhibition includes exhibits from the Mittelrhein-Museum, the Deinhard-Foundation and the Koblenz City Library. The house is an excellent example of the common architecture used in Ehrenbreitstein in mid-17th century. It’s floor space is 9×9 meters. Originally, the ground floor had been built in a very solid way, because the material used was quarry stone. The upper floor had been constructed in half-timbering. On top of this structure was a triangular gabled roof with a rounded front and a carved post. The timbering was painted red, while the bricks were kept in white. A first restoration took place in the 18th century and was carried out according to the contemporary architectural style. The city of Koblenz bought the building on July 11th 1960, had it renovated and, in cooperation with the Deinhard-Foundation, established the Mother-Beethoven-Memorial, which was opened October 26th 1975. In the period from 1987 to 1989, the square and the buil-ding underwent a redevelopment; the back building was finished at the same time. Around 1020, Ehrenbreitstein became part of the archdiocesis Trier. Since the 13th century, the prince electors increasingly used Ehrenbreitstein as their residence; in the 17th and 18th century, it became their main and permanent place of residence. Philipp Christoph von Soetern (1632–1652) erected a bastion-like castle of residence, which was situated underneath the Ehrenbreitstein fortress so it could be protected by it in case of an attack; he renamed the town »Mühlheim im Thal« (Mühlheim in the valley)»Philippsthal« (Philippsvalley). Carl Casper van der Leyen (1652–1676) pursued the extension of the residence with great circumspection: He built the orangery in 1671 and the right wing of the castle in 1672. The castle, which had been called »Neuer Bau« (new building) until then, now got the name »Philippsburg« (Philippscastle), while the town’s name was changed into »Thal« (valley). Due to the fact that Johann Hugo von Orsbeck (1676 –1711) had moved his place of residence permanently to the valley, a very busy building and constructing activity set in there. Under the reign of prince elector Franz Georg von Schönborn (1729–1756), the city of residence got its baroque character (1748 »Dikasterial«-building and stables, planning: Balthasar Neumann, implementation: Johannes Seiz). During the Rococo period, the city of Ehrenbreitstein experienced its historical heyday under the reign of Johann Philipp von Walderdorff (1756–1768). In 1761, the »Marstall« was built, being the last building to complete the residence. The last prince elector, Clemens Wenzeslaus (1768–1803), was no longer willing to invest money and effort in Philippscastle. In 1777, he moved to the Dikasterial-building and was the first one to take up residence in 1786. For one last time, Ehrenbreitstein experienced another heyday in the period of classicism. But the prince elector’s move to Koblenz sealed the fate of Ehrenbreitstein and the invasion of French troops in Koblenz in 1794 eventually marked the end of the reign of the prince electors. née Keverich (1746–1787), was born in this house on December 19th 1746 as the daughter of Johann Heinrich Keverich (1701–1759). Unfortunately, pictures of her do not exist, but there are notes by baker Gottfried Fischer, who was the family’s landlord for a time: »…Maria Magdalena van Beethoven was a beautiful and slim person and no one could say anything bad about her.« Johann Heinrich Keverich – Ludwig van Beethoven’s grandfather – got married to Anna Klara Westorff (1705–1768) in 1731. As a cook, he came to the prince elector’s court in 1733, where his father had already served as a coachman. Four of Anna’s and Johann’s children were born in Ehrenbreitstein, among them in 1746 their youngest child Maria Magdalena, Ludwig van Beethoven’s mother. On January 30th 1763, Maria Magdalena got married to Johann Georg Leym, who was employed as a personal valet at Johann Philipp von Walderdorff’s court. When Leym died on November 28th 1765, he left behind a widow who was hardly 19 years old, and who moved back in with her mother. Maria Magdalena Keverich got married to her second husband Johann van Beethoven on November 12th 1767 in Saint Remigius Church in Bonn. Beethoven worked as tenor at the electoral court chapel in Cologne. Until 1774, the family lived in Bonngasse 20, where their son Ludwig was born on Decemer 12th 1770.
employment as composer at the »Theater an der Wien« and was made freeman of the city of Vienna in 1815. From February 1818 on, his steadily increasing deafness forced him to use and carry small notebooks all the time if he wished to converse. In December 1826, Beethoven fell seriously ill. On February 22nd 1827, he dictated a letter to Schott, asking him to send him some bottles of Rhine and Moselle wine. According to the sources, when the wine was finally delivered on March 24th, Beethoven said: »What a pity, too late.« He died on March 26th. 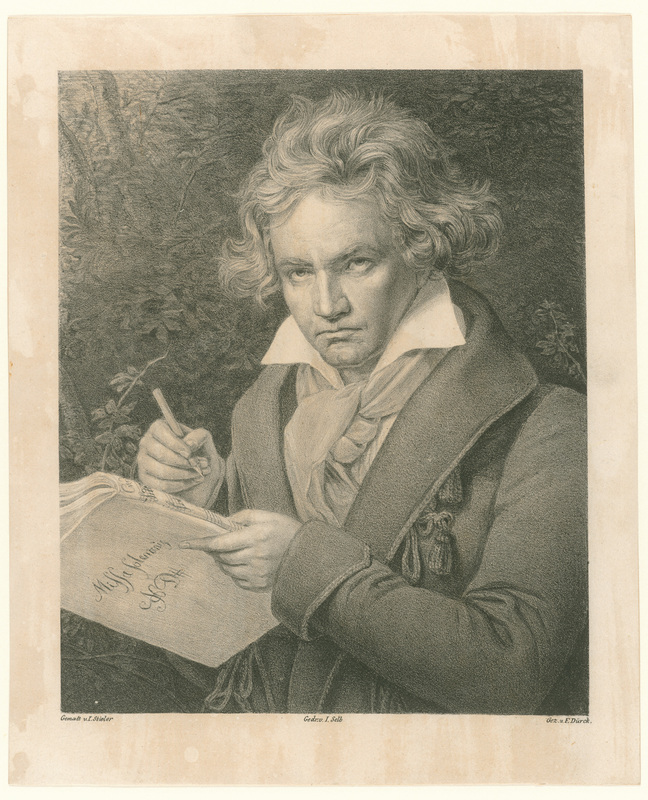 Ludwig van Beethoven had composed numerous piano and violin sonatas, cantatas, string quartets and songs, as well as his opera »Fidelio«. Beethoven also improved the symphony up to perfection. In 1771, Georg Michael Frank La Roche entered into the service of prince elector Clemens Wenzeslaus, and became minister of conference. The family moved house in Hofstraße 262. Due to the effort of La Roche’s wife Sophie, the house soon became a kind of literary meeting place, hosting many prominent and distinguished guests such as Goethe, Basedow, Lavater, the Jacobi brothers, Heinse, Merck and Wieland. After La Roche’s dismissal from office in 1780, Sophie became a »professional writer« in Speyer. Their oldest daughter Maximiliane had got married to the Frankfurt merchant Peter Anton Brentano in 1774 in the castle chapel in Ehrenbreitstein. She had given birth to four of her twelve children, among them Clemens and Bettina, at her parents’ house in Hofstraße. who formed the center of Heidelberg Romanticism together with Achim von Arnim and Joseph Görres, came to visit his native town for several times. He shared the enthusiasm for Beethoven with his sister Bettina von Arnim (1785 –1859), who started her own literary career in 1831. »European Nightingale« and Rossini-interpreter on the most important stages in Berlin, London, Paris and New York. In November 1851, she once more returned to her native town Koblenz, in order to perform in a charity concert. She died on July 17th 1854 in Mexico.